The Cape Panwa Hotel will suit those who like an active holiday, as well as those who just want to unwind thoroughly. On a tree-adorned slope overlooking the azure Andaman Sea, the location has its own private white beach, as well as two swimming pools, with one for kids. 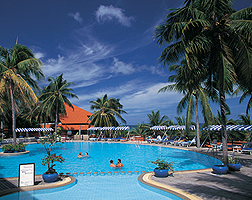 Active guests will head for the fitness centre, games room, scuba dive school, speed boats or other on-beach pursuits. Wind surfing is another option, as well as sea kayaking, snorkelling, sailing or, if you like, cruising on one of the hotel’s own yachts. You can also get competitive with games of badminton or table tennis on the powdery white beach, as well as trying your feet at Thai football. Kids will love the regular guided tours of the nearby Phuket Aquarium, the playroom with books and video games, the outdoor playground, as well as a programme of daily activities. A special kids’ menu will also be to their tastes. There’s a menu of Thai cooking lessons on offer, as well as cultural activities like batik painting and even ‘learn to speak Thai’ lessons. If doing nothing is your major activity, there’s always the pampering, soothing and rejuvenating world of the Cape Spa. There’s everything to do the job: saunas, Jacuzzis, massage rooms and treatments galore. Try the traditional Thai massage or Indian head massage and reflexology, a body scrub, polish or wrap. Weddings have a genuine magic here; choose to wed on your own private beach, with either a traditional or Thai style ceremony. You’ll have all the options to make things extra memorable. Like a romantic dinner on your own private balcony, or even the presence of a lovely (well-behaved) baby elephant. Business meetings can benefit from such a beautiful tropical setting too. Catering for up to 200 people, indoors or out, it’s a fully-equipped, professionally-run option. The hotel’s private yacht is another rather special place to socialise with colleagues and clients. Dining and socialising is a pleasure at a choice of five different restaurants and bars. Thai, French, Italian, seafood, Asian and continental cuisines all get a look in. Of course, there’s a chance to eat outside and drink in the wonderful sea views. Accommodation offers similar rich variation. You can go for suites of different sizes, villas with their own pools, or, the ultimate, the mansion-like, three-bedroom Panwa Lodge.